ZAO. Comme de nombreux enfants en Afrique, Casimir Zoba alias Zao fait son éducation musicale dans les chorales religieuses et les ballets traditionnels de Brazzaville dès l'âge de 12 ans. C'est en 1982 qu'il reçoit le prix Découverte de Radio France International pour son titre "Sorcier ensorcelé". Une chanson qui renferme déjà le style qui caractérisera Zao tout au long de sa carrière : une forme très humoristique et très second degré qui habille des chansons aux thèmes parfois très sensibles, voire tabou en Afrique comme par exemple la sorcellerie, la mort dans "Corbillard" (qui lui ouvrira les portes du label Barclay en 1984), l'armée, l'Apartheid, le Sida ou la bureaucratie. A la fois engagé et burlesque, Zao se détache du paysage musical congolais, généralement plus dévoué au soukouss, par ses compositions et l'humour de ses textes. Souvent affublé de déguisements, Zao partage sur scène sa joie de vie communicative et ses spectacles ravissent les foules. AFOUS AFOUS. Signifiant "la main dans la main" en langue touareg, le duo formé par Pascale et Jaja s’inspire de la philosophie nomade du peuple africain pour créer des mélodies aux frontières errantes entre électro et musique traditionnelle. Pour Jaja, ancien sonorisateur des Lo’Jo et fondateur du combo dub angevin Zenzile, la découverte avec la musique des Tinariwen fut une véritable révélation, ses excursions électroniques trouvant ainsi leur penchant organique. Le samedi 11 octobre se tiendront les 4èmes rencontres régionales du collectif Breizh-Niger, en pays de Morlaix. Au programme, contes Haoussas, atelier d'écriture Tifinagh, repas africain et concert avec le groupe touareg Kel Assouf. Réservation et infos : 02 98 78 65 35 ou resia@ritimo.org. Tinariwen terminera le 29 août sa tournée de 18 mois pour la promotion de "Aman iman". Les musiciens vont pouvoir goûter à un repos bien mérité avant de commencer le travail sur un nouvel album, qu'ils espèrent pouvoir enregistrer au désert. Le groupe vient de recevoir à Hanovre le prix Praetorius, pour "sa contribution à la société au travers de la musique". They stand tall and proud in the barren desert landscape, flowing robes and headdresses protecting them from the sun - a picture of traditional nomadic tribespeople. 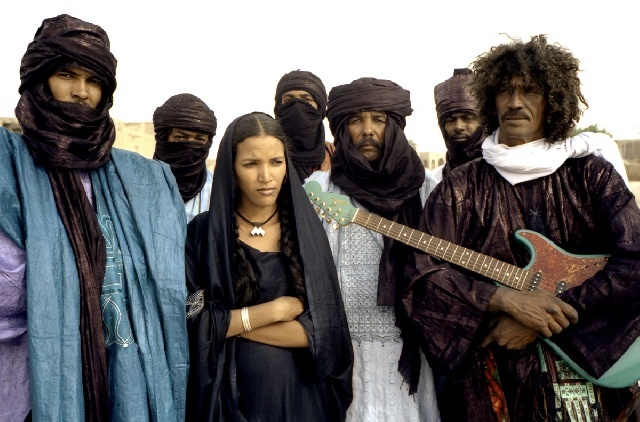 But, on stage, the members of Saharan band Tinariwen are fully plugged into the modern Western world with a sound dominated by electric guitar. Theirs is an intriguing blend combining haunting chant-like vocals with full-on bluesy rock riffs that has been capturing the imagination of British musicians as well as audiences all over Europe, starting at world music festivals. Chris Martin told Rolling Stone magazine recently that the band's sound had a great influence on Coldplay's new album, Viva la Vida or Death and All His Friends. Last time Tinariwen were in Cornwall was to be part of the Live 8 Africa Calling show at the Eden Project three years ago. Next week they return to headline their own show at Falmouth's Princess Pavilion as part of a UK tour. The band's history is steeped in myth and romanticism - their quiet musical revolution was going on for 20 years before anyone outside Africa sat up and listened to their songs of independence and survival. At its heart is founder member and lead vocalist Ibrahim Ag Alhabib (aka Abaraybone), whose father was killed by the Malian government. He is credited with inventing the Tamashek electric guitar back in 1982 when he teamed up with two other young Tuareg exiles in the desert oasis of Tamanrasset in South Algeria - Hassan Ag Touhami (aka The Lion of the Desert) and Inteyeden (who died in 1994). All three fell in love with the sound of the guitar and the power of amplification, representing modernity and freedom. They wrote songs about the lives they had left behind and their new existence away from family and friends and called themselves Kel Tinariwen, the "desert boys". During the 1980s they became soldier-musicians in the military camps of Colonel Gaddafi in Libya. After fighting a brief rebellion against the government of Mali, with their songs as the soundtrack, they accepted peace and turned to music full-time. After recording many albums on cassette, their first album in CD format in 2000 - The Radio Tisdas Sessions - was the first available outside of Africa. 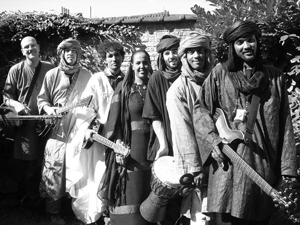 Their performance at Le Festival au Desert, in a remote region of the Sahara Desert, in 2001, opened the doors further to world audiences, and they have been making ever bigger waves ever since. Line-ups have been fluid through the years, but always with the wild-haired troubadour Ibrahim at the helm and Hassan providing compelling dance grooves. Tinariwen have dedicated their latest and third album, Aman Iman, to "peace, tolerance and development in the Sahara and in the world of the oppressed". It was produced by British musician and composer Justin Adams, who is renowned for his work with Robert Plant, and has done much to break new ground in the world music field. (c) 2008 Western Morning News, The Plymouth (UK). Provided by ProQuest LLC. All rights Reserved.